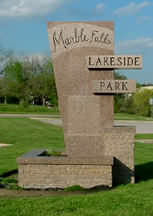 The town of Marble Falls is located on the banks of Lake Marble Falls and is only 5 minutes from Lake LBJ. Marble Falls, population approximately 7200, is only about 45 miles from Austin. Many residents commute from Marble Falls to work in the Austin metroplex. 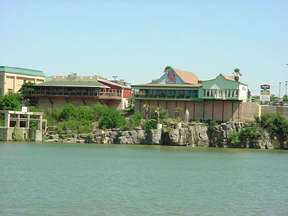 Lake Marble Falls with waterfront hotel and restaurants. General Adam Rankin Johnson, retired from the Confederate army, founded Marble Falls in 1887. "Stovepipe" Johnson got his nickname for his Civil War escapades, which included duping the Union army in Newburgh, Indiana, with fake "cannons," constructed from stovepipes and wagon wheels. San Antonio is only 85 miles to the south for additional shopping and sight seeing. It is a pleasant, scenic drive straight down Highway 281. You will find plenty to do in the Marble Falls area. Boating, fishing, golf, hunting, camping, swimming, sightseeing and shopping are just a few of the things to look forward to. You will also enjoy the friendliness of the local people. Before the dam was built to form Lake Marble Falls on the Colorado River, there were falls of marble giving the name Marble Falls to the city. The falls are now under water and only visible on those rare occasions when LCRA lowers the lake for repairs. A fast growing town of 6,500, with over 10,000 population in a 7 mile radius, Marble Falls is going through a period of prosperity and growth. Because of the growth, there are not as many homes available for sale or rent in town right now. Marble Falls is in a stage of development now that offers some of the best of the big city life without the disadvantages of the fast pace and traffic problems of Austin or San Antonio. It is an interesting mixture of a rural lifestyle with big city conveniences only 45 minutes away. 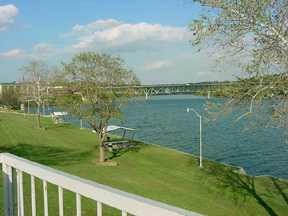 3 Bedroom, 3 bath lake house on the Colorado Arm of Lake LBJ about 15 minutes from Marble Falls. "Texas fare with and Italian Flair." Combines wonderful herbal flavors of Mediterranean cooking with the robust, meaty tastes and textures of Texas fare. 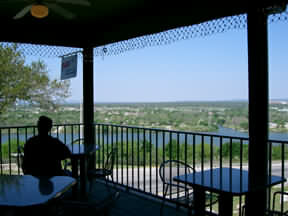 Overlooking Lake Marble Falls with a fantastic view. This cafe is "Truly World Famous" for its home style cooking. A favorite with both the tourists and the locals. Specializing in Lake LBJ Real Estate including waterfront and residential real estate in the Lake LBJ area. This lakefront vacation home is for rent by the day, week or longer. It will sleep up to 8 people. Just minutes from Burnet, Marble Falls and Kingsland. Winter Texans welcome. Marble Falls has two very nice parks. One is on the creek and the other is on the shore of Lake Marble Falls. 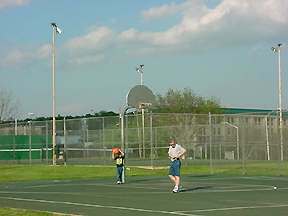 Both parks are large enough for reunions, events, or just having a lot of fun with friends and family. 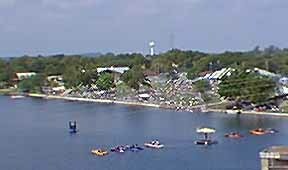 Lakeside Park is the perfect place for a picnic while watching the boating activity on the lake and enjoying the gentle lake breezes. Want to do a little swimming in the lake. 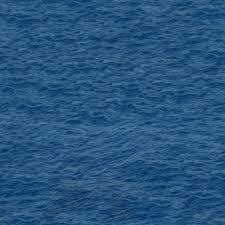 Here is the perfect place to do it. 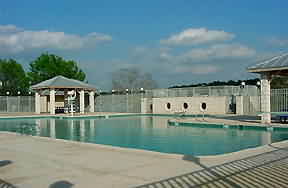 Marble Falls Lakeside Park also has a great swimming pool, and tennis and basketball courts. There is also a pavillion for events, a boat launch, covered picnic tables and plenty of room for spreading out on the lawn and enjoying the lake. Marble Falls is the "Hub" of the upper Highland Lakes area when it comes to shopping. You will find many restaurants, gift and antique stores, a 24 Hour WalMart Super Store, a very large and modern HEB Grocery Store, Home Depot, realtors, auto dealers and repair shops, 2 movie theatres, an RV park, and motels. You will find plenty of restaurants in Marble Falls. Most of the tourists always stop at the "World Famous" Blue Bonnet cafe for one of their great breakfasts or home cooked lunches. The Blue Bonnet Cafe has been serving meals in Marble Falls for over 70 years and Texas Highways Magazine selected them for the best breakfast in Texas and in the top ten restaurants in Texas. 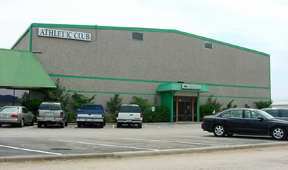 Other restaurants in Marble Falls include two waterfront restaurants, two Italian restaurants, two Chinese restaurants, two B-B-Q restaurants, four Mexican restaurants, a steak and seafonnd restaurant, and a catfish restaurant. Fast food restaurants include: Subway, McDonalds, Wendys, WhataBurger, Jack-In-The-Box, Dairy Queen, Church's Chicken, Sonic, Schlotsky's, Taco Bell, Taco Casa, Mr. Gattis, and Pizza Hut.